Family life - North Carolina - Fiction. "I love reading Lois Gladys Leppard's books! I find it practically impossible to put them down!" writes a young reader from Northern Ireland. Mandie is excited about going home for Christmas, but she hasn't told her grandmother that she invited Jonathan Guyer and his father to visit them during the holidays. Will Mrs. Taft be angry with Mandie because she doesn't get along with Mr. Guyer? And Mandie hasn't told Joe that Jonathan is coming, and the two boys haven't gotten along well either. Will Joe be upset with Mandie? 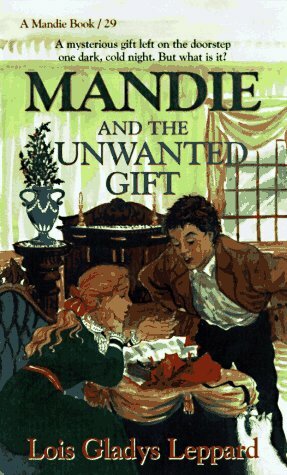 Then on a dark, cold night a mysterious gift is left on the doorstep of the Shaw house with an anonymous note attached that reads, "For Mandie." The box has fancy gift wrapping on the outside, but inside is what appears to be a childish jumble of holly and dirt and ribbons. Whatever could it be? Who sent Mandie the present? Could it be a treasure map?